Tired? Fatigued? Exhausted? Are you done? Fatigue can affect your mood and performance a lot. Everyone goes through a period of fatigue sometimes, but if this period of time just keeps going, this can have major consequences. Sleep is an essential element in your daily life. It helps you to perform, focus, remember, and most of all to be happy. Fatigue is therefore often a symptom of a larger problem such as depression or anxiety. Sleep is often one of the first patterns which is affected by psychological problems. Fatigue does not need to be long-term. Yet, it can be useful to read through this article so you can check for yourself in what stage your fatigue is, and if there might be more going on. If there is a psychological problem at play, chances are also great that the fatigue will take a lot of time or returns more than once. Fatigue is the feeling which you have after having slept for a very short time or having slept poorly during a certain period of time. Depending on your age, you need a certain amount of hours of sleep. These are just guidelines, which can differ from person to person. Your environment and experiences also affect your sleep requirements. However, if you get less sleep than what you need, fatigue and a fatigued feeling develop. What is the influence of fatigue? When fatigue takes over, you will notice that your ability to perform lowers. Simple tasks, too, will become more difficult. Fatigue also affects functions such as memory and focus. Also, fatigue can cause both physical and psychological diseases to develop more easily. Sleep namely makes it so that your immune system repairs itself and that we can deal with eventual psychological damage. This is why it can be so that you can deal with more stress after you have had a good night’s sleep. However, if you suffer from fatigue, this is something which can cause illnesses and psychological problems. Sleep thus makes it so that we can start a new day in a fresh way. It also makes it so that we can deal with negative influences. Fatigue can definitely be harmful. The impact of fatigue after one day will not be so large, but if your fatigue lasts for more time, more damage will be done. After one day, fatigue influences your focus and performance. After a long period of time, it will also affect your mood and happiness, possibly in major ways. Long-term fatigue can thus definitely lead to issues such as depression and burnout. It is thus useful to check out your fatigue. Definitely when you have experienced a fatigue more than once, it is good to check out what is going on behind your fatigue. Test your fatigue level here at the hand of the free fatigue test. How fatigued you are differs from person to person. It thus is a subjective experience. Therefore it is very difficult to objectively measure this subjective experience of fatigue. There are different tests which have tried to map out fatigue. While they are accurate, they find it difficult to objectively map out fatigue. Even biological tests cannot do so. While it is difficult to objectively map out fatigue, this does not mean that you cannot test your fatigue. Because fatigue is subjective, it is very difficult to compare one fatigue to another. You will, for example, notice that your partner needs less sleep than you do. However, this does not mean much, because every person is different. If you then have the idea to sleep less as well, it can be so that you become very fatigued. How do I know how fatigued I am exactly? You can measure your fatigue level at the hand of consequences and symptoms. By mapping out the symptoms which you experience, caused by your fatigue, you can see how severe your fatigue might or might not be. By testing the consequences, too, you can see if it is any use to look for help. For example, someone who notices that their functioning is affected severely, a major type of fatigue is likely to be at play. Also make sure to link it to psychological symptoms. In most cases, fatigue has to do with a psychological cause. What are possible causes of fatigue? There is a range of different causes of fatigue. Not only physical causes can cause fatigue. Psychological causes actually stand for 80% of the fatigue symptoms, according to Prof. Cogan. As mentioned earlier, psychological causes stand for 80% of the causes of fatigue. With psychological causes we mean issues such as long-term stress, as well as depression and anxiety. In its turn, fatigue can also lead to symptoms of depression, anxiety, and even burnout. It is thus some type of reciprocal relationship, which needs to be watched closely. There still is a large taboo regarding psychological problems and psychological causes. When people go to their doctor considering their fatigue, they often expect to be ill. For many people it is not easy to hear that they might be suffering because of a psychological cause. Because there is such a taboo regarding psychological problems, it is difficult to know how to treat these causes. Except for the issue with often not knowing how to treat these causes of fatigue, many people do not dare to take the step toward support, either. The taboo often still has such a major influence, that people think that they are weak or crazy when they would have to go to a psychologist. Do weak people risk experiencing psychological problems more easily? People often still think that only ‘weak’ people suffer from psychological issues. In reality it can be anyone, from a CEO to a cleaning lady, who is vulnerable to psychological problems. Experiencing psychological issues has nothing to do with weakness or dumbness, but simply with an unhealthy reaction to a difficult situation. An example of this would be someone who constantly stays late at work, even though this person might be very stressed by their work. Does this response make someone a weak person? Or that the person is dumb? No, it just means that they pressure their brain too much for a certain amount of time, which can be seen as an unhealthy response. Of course, this person has larger risks of getting a burnout than their colleague who goes to a bar every day after work. The colleague can namely relax once in a while, which someone who works overtime constantly has a lesser chance to do. Another example is a top athlete. You often hear that they get injured because they are sporting at such a high level. You are not injured, are you? Does this mean that you are healthier than this top athlete? People often do not make the link to psychological problems, but the principle is the same. If you exhaust something and constantly use it, chances of getting injured are larger. Everyone has their own limits and their own experiences. These differ from person to person, but that which is the same for everyone, is that long-term overwhelming of your brain will lead to psychological problems. Except for the psychological causes of fatigue, there also are several physical causes, which can lead to fatigue. Examples could include infections, such as viral or bacterial infections. An example of this could be hepatitis. Metabolism issues could also lead to increased levels of fatigue. Diabetes is a frequently occurring example thereof. Furthermore there are heart issues, neurological problems, muscular diseases, and other things which can influence your fatigue a lot. Test your fatigue level at the hand of the free fatigue test. Symptoms of fatigue are not always easy to recognize. They occur at different levels, too. One is worse than the other. To be able to decide whether it might be useful to look for help for your fatigue, it is good to map your symptoms and consequences of your fatigue. A handy tool for mapping out your symptoms of fatigue and possible consequences of this fatigue, is the free online fatigue test. Below, you will find a list of the most important symptoms of fatigue. Remember that they can be present at different levels, which can cause them to have/not to have certain consequences. You have no energy anymore. You suffer from inexplicable weight loss. Your temperature changes a lot. You freeze, and then you suddenly are hot again. You suddenly get signals, which could indicate that your organs might not work the wa they should. You constantly suffer from stress or feel pushed. You get issues with your memory, issues with things which you used to easily remember. You find it difficult to focus. How do I treat my symptoms of fatigue? If you suffer from symptoms and consequences of fatigue for a long period of time, it is useful to check out your level of fatigue. If you feel like you can simply not continue, that you need a solution, it is definitely useful to take steps toward getting help. First of all, it is useful to check if there might be physical causes of fatigue. This way, you know what it is that causes your fatigue, meaning you can start looking for suitable help. For psychological causes, too, there are different ways of treating your fatigue. For example, “15Minutes4Me.com” offers an online program, which guides you daily in the treatment of your symptoms of fatigue! What are possible consequences of fatigue? Fatigue can have different consequences. Many people think that fatigue can do no harm. Or that fatigue does not have any major consequences. This is not true, though. Fatigue can do major damage, which takes a lot of time to treat or to solve. Therefore, it can be useful to read more here about the consequences of fatigue. It is useful to recognize them early on, so that they are treated more quickly. The longer you wait, the longer it will take for you to treat them. What are physical consequences of fatigue? Thanks to your fatigue, it is likely that your immune system will quickly be affected. This means that you are more vulnerable to many different types of illnesses. Not only your immune system suffers from your fatigue, but your entire body will start to have issues. Muscular ache is also a common consequence of fatigue. Also, fatigue often links to the experience of increased levels of stress. This stress can also cause several physical issues. Examples could include different skin diseases. What are psychological consequences of fatigue? Psychological consequences of fatigue could include depression, burnout, and anxiety disorders, for example. If the symptoms of fatigue add up, depression has large chances of developing, as fatigue can affect your mood a lot. It is useful to treat these consequences of fatigue as early on as possible. Symptoms of depression and such namely require a lot more time to treat. At the hand of our free fatigue test you can check which type of fatigue symptoms and consequences you might be experiencing due to your fatigue. It will tell you which consequences you already suffer from and how to treat these. The longer you wait with testing your fatigue consequences, the more time it will take before you once again are depression or anxiety free. From research it has become clear that people, who follow the online self-help program, experience hardly any stress anymore after about 3 weeks. Different from anxiety and depression, stress and fatigue symptoms can thus be treated relatively quickly. Test your fatigue level at the hand of the free fatigue test here. What is good treatment for fatigue? Fatigue can be treated in different ways. As mentioned before, it is useful to check which the causes of your fatigue are. It is namely not useful to start up psychological treatment when your fatigue is caused by a metabolic disease. In most cases, however, fatigue is caused by psychological symptoms, for which there are many types of treatment available when it comes to the fatigue, too. 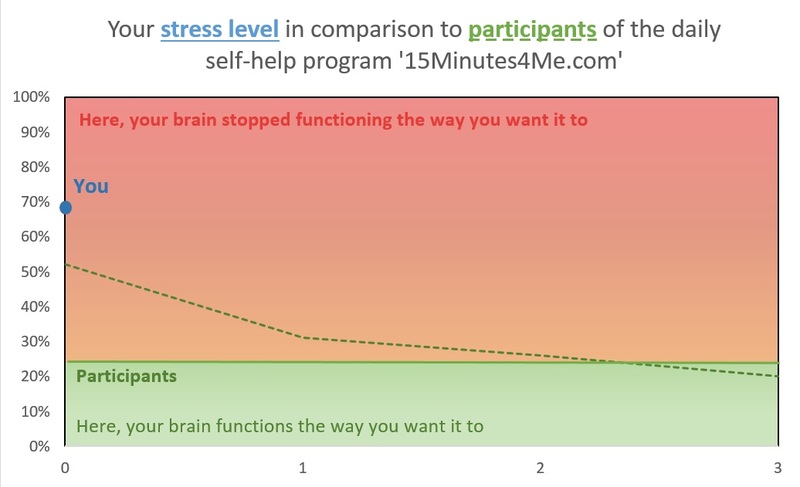 “15Minutes4Me.com” is one of the possible ways of treating the psychological causes of fatigue. The program was developed by doctors and psychologists and was based on the cognitive and systematic solution focused therapy. The program follows up with you on a daily basis, so that you will notice quicker effects from the therapeutic techniques. Recent research has shown that participants are stress free after about 3 weeks. As stress generally causes fatigue, the symptoms of fatigue can easily be treated, relatively quickly. If fatigue rather is triggered by depression, it will generally take about 6 weeks before you are rid of your symptoms. Anxiety is one of the most stubborn disorders, which is treated in this program, and generally requires a treatment of 12 weeks.